It happened a second time, of course. In all, I enjoyed Mind MGMT Vol. 2: The Futurist more than I did the initial volume. While for most of the volume I still felt Meru lacked a certain quality to make the reader really care for her, I did like the offbeat "team" that emerges in these pages. 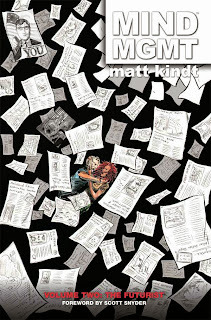 Certainly writer Matt Kindt layers each page with characters with increasingly more unusual mental powers, and Kindt's exploration of these is fascinating -- what would it really be like if you could see the future? Control minds completely, other people's or even your own -- making the reader think in the way good science-fiction should. As with Mind MGMT Vol. 1, however, there's a twist here, one that again caught me flatfooted and that recasts not just elements of this volume but of the first one as well. By the end of this book, every complaint I had about Mind MGMT has been answered, every aspect that seemed "off" to me now explained and fully integrated into the story. Kindt knows just what he's doing here, no question, and with this volume's great cliffhanger, I'm now firmly along for the ride. Whereas the first volume of Mind MGMT spotlighted Meru mostly on her own -- in a vacuum that, in my opinion, distanced her from the reader -- this second volume allows Meru to interact with the book's burgeoning supporting cast. The beginnings of this were in the previous book -- Henry Lyme, of course, but also Perrier (though this time, it's the other Perrier), and the "futurist," Duncan. Meru imagines the four, plus the Musician, as a dysfunctional family, and it's that distinction that separates them from your average super-team; far from costumed do-gooders, Mind MGMT's "heroes" are all survivors (knowingly or not) of the Mind Management organization's implosion, and it's interesting to watch Meru try to conceptualize and find her place with them. This book's true turning point, however, is the revelation that Meru is a former Mind Management agent with the ability to dampen powers, and that she had a relationship with Bill, another former agent now mind-wiped and working for the CIA. Indeed, Kindt surprised me entirely -- even when Ferris takes the pseudonym "Bill" I didn't get it, nor did I consider too strongly why the woman Bill is seeing is bald (what purpose, that is, Kindt would have for making her bald, which is to further prevent the reader from realizing this is Meru). It was not until the end of chapter 11, when Bill actually speaks Meru's name, that I finally understood. Lesson learned: every character and every element of this book must be examined much more carefully. My chief complaint about Mind MGMT Vol. 1, the one element that I stated previously still stuck out to me, was why Meru trusted Bill so implicitly. Some of Meru taking her quest to find Lyme in stride stemmed from her having searched for Lyme previously (even if she couldn't remember doing so), but it seemed off to me that Meru should trust Bill so implicitly when he showed up at her door, when every movie and comic book cliche suggests Bill's sudden appearance would definitely make him a bad guy. Instead, we find once again that Kindt has it all under control, planning everything -- even what looks like a misstep -- from the beginning. This volume still includes the Mind Management guide rules up the side of the page, but also for a good part of the book this is replaced by excerpts seemingly from Meru's book (though the exact authorship is a little fuzzy). My pet theory is that the woman mentioned in the book, who murdered her family and is last seen in prison, is actually the Eraser, whom Duncan frees from prison; the Eraser seems at this point to be the book's main villain, working to restart the Management organization. It remains a little problematic to keep having to pause every page to read the excerpt on the side, connect it back to the page before, and then continue; I'm not quite at the point where I'll read the main pages first and then start over and read the side-type second, but almost. Futurist's cliffhanger grabbed me more than Manager's did with Meru forgetting Lyme and returning to her life. Now, Meru and Bill are on the run, having both escaped the Eraser and shrugged off Lyme's team. Both groups worry what will happen when Meru "picks a side." I'm reminded of the late, lamented Heroes here, where Peter's ability to mimic other people's powers made him one of the most dangerous characters even as he had no specific powers on his own. Meru is the same way, and her defection from Lyme's team makes their motives more questionable; I think we're entering a period of Mind MGMT where neither team is necessarily "good" or looking out for Meru's best interests. I'm curious to see that play out, with Meru battling both sides, as the series continues. In my review of the Manager, I suggested that if a reader was going to read one chapter, they should stay for the whole book, because much is revealed about the whole story in the final pages. I'll modify that now to say that if you're curious about Mind MGMT, reserve judgment until you've read both Manager and Mind MGMT Vol. 2: The Futurist. The second volume clarifies and redeems the first; I wasn't sure about Matt Kindt's new series before, but volume two has made me a believer.